India’s Mars Orbiter Mission (MOM) probe suffered a surprise hiccup overnight (Nov. 11 IST) when the main engine shut down prematurely and left the country’s first ever mission to the Red Planet flying in a significantly lower than planned interim elliptical orbit around Earth – following what was to be her 4th orbit raising burn since last week’s flawless launch. “MOM is in normal health,” at this time according to the Indian Space Research Organization (ISRO) – which has now scheduled a supplementary main engine firing for early Tuesday (Nov. 12) to boost the crafts orbit the missing 20,000 km required. Monday’s engine firing only raised MOM’s apogee (farthest point to Earth) from 71,623 km to 78,276 km compared to the originally planned apogee of about 100,000 [1 lakh] km), said ISRO in a press release. This is the first serious problem to strike MOM in space. And it seemed clear to me something might be amiss when ISRO failed to quickly announce a successful completion of the 4th firing as had been the pattern for the initial three burns. The premature shutdown of the liquid fueled 440 Newton main engine “imparted an incremental velocity of 35 metres/second as against 130 metres/second originally planned,” ISRO stated. That’s barely a quarter of what was hoped for. A series of six absolutely essential firings of the 440 Newton main engine – dubbed “midnight maneuvers” – had been originally scheduled by Indian space engineers. The purpose of the “midnight maneuvers” is to achieve Earth escape velocity by gradually raising MOM’s apogee over several weeks, and set her on a trans Mars trajectory to the Red Planet, following the spectacular blastoff on Nov. 5 from India’s spaceport. MOM was due to depart Earth’s orbit on Dec. 1 after accomplishing the 6th of the originally scheduled thruster firings – and begin a 10 month long interplanetary cruise to Mars. The 1st, 2nd and 3rd thruster firings were spot on and incrementally raised MOM’s apogee from 23556 km to 28814 km, 40186 km and 71,623 km respectively. The next firing had been slated for Nov. 16. “During the fourth orbit-raising operations held today (November 11, 2013), the redundancies built-in for the propulsion system were exercised, namely, (a) energising the primary and redundant coils of the solenoid flow control valve of 440 Newton Liquid Engine and (b) logic for thrust augmentation by the attitude control thrusters, when needed. It is not known at this time how or whether the requirement for a supplemental “midnight maneuver” engine firing will affect the mission’s timing at Earth and its operations and longevity at Mars. Why are the firings called midnight maneuvers? “Firing has to happen near the perigee and in the visibility from ISTRAC ground stations. All these orbits have argument of perigee of ~285 deg. 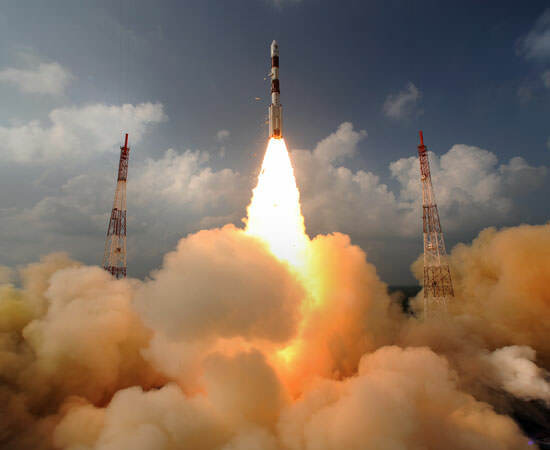 When all these constraints are put together, firings time will almost always fall in to midnights of Indian sub continent,” said ISRO in response to a readers inquiry. MOM was to arrive in the vicinity of Mars on September 24, 2014 when the absolutely essential Mars orbital insertion firing by the 440 Newton liquid fueled main engine will slow the probe and place it into a 366 km x 80,000 km elliptical orbit. The low cost $69 Million MOM mission is the first of two new Mars orbiter science probes from Earth blasting off for the Red Planet this November. Half a world away, NASA’s $671 Million MAVEN orbiter remains on target to launch in less than one week on Nov. 18 – from Cape Canaveral, Florida. What I don’t understand is why 5 am IST? The satellite will not be visible from India and it will be in an odd position in its orbit for addition of thrust. hey mister. NASA just confirmed that it would assist in communication and navigation of Mangalyaan. It is not directly providing any assistance to ISRO for any kind of navigation. ISRO is self sufficient in handling any of its project and any other organisation has no need to assist it. This time it is ISRO and only ISRO. Yes thats because india doesnt have monitoring stations throughout the world like USA – but the mars mission is entirely indias technology .. The satellite is not visible to human eyes any ways, doest matter day or night. Pretty cool! Good luck India! The supplementary orbit raising manoeuver of ISRO’s Mars Orbiter Mission spacecraft, to raise the apogee height to about 1 lakh km completed successfully. Velocity added is 124.9 m/s. Long article is long. Is the mission still salvageable? Yeah, the mission is back on track. The supplementary maneuver to raise the satellite to required orbit was successful as of today morning 5:30 AM IST. 2013, with a burn Time of 303.8 seconds has been successfully completed. The observed change in Apogee is from 78276 km to 118642 km. I think NASA will help in Deep space navigation when orbiter is near Mars and during non-visible period of ISRO’s network. Say “Hi” to my stranded Kerbals.